How can we possibly know where UFOs will choose to land, should mass landings occur? While we cannot know the alien mind, it is irrefutable that these UFO occupants are highly intelligent and therefore, logical. It might not be our idea of logic, but one mutual perception humans share with the UFO occupants must be the perception of the existence of the blue/green planet called Earth. If we were looking at Earth from on high, and planning mass landings, where would we choose? Where would be our top ten choices? The objective of mass landings would be intended for humankind’s perception, because for many years, UFOs have been sited over relatively vacant mountains, fields, valleys, dark highways – all places where humans en masse, are not. At the time of mass landings, which many feel will be soon, suddenly UFOs will be aiming for places where many humans are, not just to fly over, but to land. Following logic, Earth is composed of land and sea. There would be no point in landing on the sea because few humans are out there. So, let’s look at the land. The militaries of Earth are a constant hassle to UFOs, whether the UFO occupants are good guys or bad guys. UFO occupants would not want to land with a military base nearby. When the alien folk actually set foot, claws, paws, hooves, or pedestals, on Earth soil, they would be more vulnerable than in the skies nestled within their advanced craft. They might figure if they could land quickly and quietly, not tipping off the military, that they would have a period of time on the ground before the alarm went up that the aliens had landed. Therefore, UFO occupants would plan to land where there are a reasonable number of humans, but not near a military base. The UFO beings would logically feel they should make themselves known on every continent of Earth, with the possible exception of Antarctica, where many believe they have a large base, anyway. Northern and Southern Hemispheres should be represented in the landings. The aliens’ perspective from on high is that Earth is one planet, and so countries like the United States, which thinks of itself as important on the world stage, might not be considered to be any more important than the smallest of countries. Will traditionally mystical areas enter into the aliens’ decision? Will Stonehenge, the plains of Nazca, the Egyptian pyramids, Mount Shasta, or Newgrange, be among the preferred landing sites? Logically, there is no reason that UFO occupants would have to land near these places. Even if “ancient astronauts” were involved in some of these places, the aliens today might not be any more sentimental about those places than humans are about having likely roots in Afghanistan. These places are not places to automatically toss into the top landing site choices. However, other aliens may argue that humans have placed great importance in a number of mystical sites over the years, and that since these first landings are largely symbolic in nature, then the mystical sites should be well represented. With these logical qualifications in mind, and with a bit of intuitive guidance, here are the top ten likely UFO landing sites when the objective finally becomes: To meet and greet humans. Then what happens after the mass landings? That is a subject for another day. Lake Baikal, the oldest and deepest lake on the planet, suffers from pollution these days. Local stories have it that the Lake Baikal monster is the result of ingesting contaminated water. Logically, UFO occupants would choose a symbolic place where Planet Earth has created an amazing body of water which is 30 million years old; aliens would be aware of the fact that Lake Baikal has enough water to supply the world with fresh water for half a century. However, it has been badly contaminated by human ignorance and carelessness, another truth the aliens might wish to stress. Lake Baikal is still remote, the nearest airport is in the city of Irkatsk, an hour away. Here, the Yesilirmak (Green River) flows through a fertile delta. This is the ancient land of the Amazons, a legend which later spread to South America. The Amazon River, of course was named after this mythical tribe of warrior women along the Yesilirmak in what is now Turkey. UFO occupants would choose a symbolic area where the female of the human species once ruled, in an effort to embrace both male and female aspects of universal creation. Turkey is itself an ancient civilization, standing between East and West; UFO occupants would wish to acknowledge both cultural traditions of humankind. The Amazon River and Rain Forest are the most vital resource on the face of the planet; extraterrestrials would wish to give symbolic importance to this important feature of Earth’s surface, which provides a home for uncounted exotic life forms. Logging and clearing of vast areas of the Amazon Rainforest, are a threat to the entire planet. Certainly UFO occupants would wish to pay tribute to “the lungs of Planet Earth,” The Amazon River and Rainforest. Also, along the Amazon there still exist Native Tribes who are threatened by commercial interests which want them off the land; UFO occupants perceive this as an ancient struggle between corporate greed and the native, original human, and would wish to acknowledge this struggle. On the south side of the 80th largest island in the world, Kodiak Island, there are few trees; this is good for landing. Kodiak’s north and west sides are mountainous and forested. Landing on the south side of Kodiak, UFO occupants symbolically acknowledge the extreme northern ecosystems of Earth. Kodiak is the home of the Kodiak Bear, King Salmon, King Crab, and a number of other unique Arctic life forms. Also the Inuit Native People represent the northern native human tribes which UFO occupants would wish to acknowledge. It would be planned that a number of Native People would witness the actual mass landings of UFOs. More than 4,000 years ago, Cheng Du was the location of the beginning of the Bronze Age. Today, it is the thriving commercial and financial center of Sichuan Province in southeast China. This area has recently been plagued with earthquakes, several of which were high on the Richter scale. UFO occupants wish to recognize China, home to one third of the human population and one of the birthplaces of human civilization, as well acknowledging its recent struggles against “earth changes,” which includes huge sink holes as well as earthquakes, the threat of massive government-built hydroelectric dams bursting, and the extreme pollution of the area’s rivers. In another acknowledgement of Earth’s original native people, UFO occupants might well choose to land near Ayers Rock, in the southern part of Australia’s Northern Territory. The Anangu, which is the Aborigines’ name their tribe, long ago believed that Uluru (Ayers Rock) landed upon the desert plain “from the sky.” UFO occupants also wish to “meet and greet” both New Zealand and Australia’s current civilizations. As time progresses, UFOs will land in many other areas, including New Zealand, and perhaps choosing “which will be the first ten sites?’’ is a difficult decision which aliens have debated amongst themselves. Near the town of Ghanzi in the western part of the Kalahari Desert. Ghanzi has an approximate population of 9, 990 people which makes it a good landing site. UFO occupants will at long last wish to be seen, but will not land in huge cities first, unlike some speculations. Aliens will plan to land in large cities soon after the human population assimilates the news of the ten first landings. The Kalahari Desert, which is exotically red in some areas, used to have much more rain. Elephants, giraffes, several species of big cats, and other African wildlife used to live in the semi-arid Kalahari. Over-development and grazing land have spoiled this natural area for native wildlife, and UFO occupants wish to acknowledge these problems which are truly worldwide. They also wish to a acknowledge Mother Africa, the birthplace of all of Earth’s many tribes. “Do we land in the United Kingdom, or Ireland? We note that this ancient dispute is heating up again.” And so, aliens may well choose the largest of the Summer Isles in Scotland. While technically in the United Kingdom, Scotland has retained pride in its Celtic roots along with Ireland and Wales. UFO occupants also would give a nod to ancient pagan ways which are exemplified in the image of the Summer Isles, in northwest Scotland and are as unspoiled as any place in Europe. This landing is the acknowledgement of Europe in the first ten landings. Other European areas will receive landings soon thereafter. UFO occupants acknowledge the first UFO landing in movie history at Devil’s Tower in “Close Encounters of the Third Kind.” They would wish humankind to know that they (the aliens), are well aware of our culture and curiosity about them, and so this almost humorous tenth choice in the continental United States. 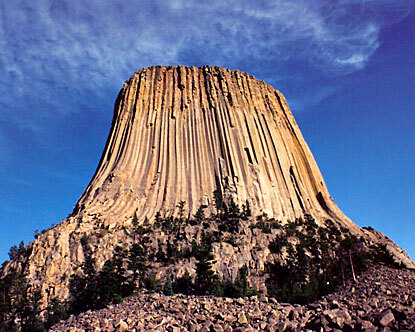 Devil’s Tower was first called “Bad God’s Tower” by an English explorer when his interpreter misunderstood him. However, this unusual formation which remains a puzzle as to its exact origin, was a sacred place for many native tribes for thousands of years; these include the Lakota, Shoshone, Arapaho, Crow, and Cheyenne. In their first landings, aliens wish to acknowledge the native tribes of Earth, rather than the current large cities and dominant financial centers. This is in line with the spirituality which many feel people from the positive extraterrestrial and other-dimensional beings.